Duncan Jones, the son of David Bowie and known as a child as Zowie, might well understand the surreal. His first film, Moon (2009), starring Sam Rockwell, was an intriguing sci-fi-exploration of alienation and loneliness in remote space -- a theme Bowie himself embodied memorably in Nicolas Roeg's 1976 Man Who Fell to Earth, made when Zowie, later "Joe," now Duncan, was a tyke. But Rockwell's character, the lone man overseeing an automatic mining operation on the moon, has more than loneliness to deal with. He doesn't know who or what he is, as he and we find out with a shock of surprise toward the film's end. Rockwell excels at a nerdy, slightly crazy everyman. With economy and modest means, Moon echoes the alienation and doom of Kubrick's 2001: A Space Odyssey. It leads toward transformation and self-discovery. Jones's sophomore effort, Source Code, is predictably more expensive and supplied with a star who's bigger box office, Jake Gyllenhaal. 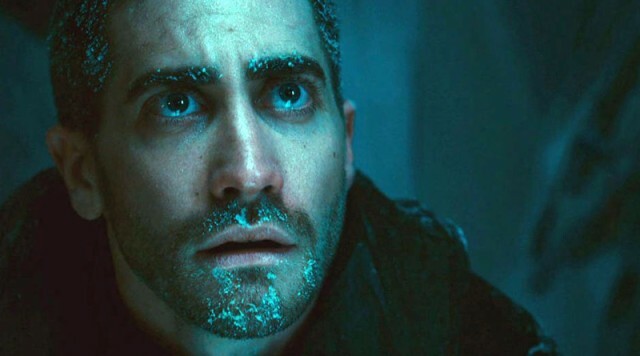 Gyllenhaal is a very busy actor now, though it wasn't till his twelfth movie that he had an action role (Roland Emmerich's eco-thriller Day After Tomorrow). Action, and more money, means explosions, and Source Code has a series of those, and complicated scenes with lots of extras. Moon, which essentially had only one character, was a think piece. Source Code tries to be both that and a thriller, with a suspenseful search for a terrorist but also a twisty high-concept exploration of time and consciousness. Which is where it runs into very serious trouble. Moon was on slightly over-familiar sci-fi ground with its man-out-in-space theme, but the premise was easy for audiences to grasp. Not so easy to swallow the Source Code idea, or even understand it. The brain lives on for eight minutes after death, we're told. Or it's possible to recover the brainwaves of the last eight minutes of life. Something like that. (Scientists consulted about this idea don't buy it for a minute.) The movie begins well, though, banking on Gyllenhaal's own more earnest everyman qualities (and a good dose of his Jar Head military muscle), with a theme Hitchcock liked: an innocent man caught in a dangerous situation he doesn't understand. Coulter Stevens (Jake's character) wakes up a stranger on a train (another trope of the Hitchcockian glory days) only to find himself with a pretty girl he doesn't know (Michelle Monaghan), who thinks he's somebody else. A glimpse in the bathroom mirror tells him he also looks like somebody else. He only has a chance to focus on some of the oddballs in the train car besides the girl -- when everything blows up. Then Coulter is addressed by a cool female bureaucrat on a TV monitor, a Ms. Goodwin (Vera Farmiga). In the background is a quirky Jeffrey Wright, the mastermind behind this project. Coulter is on assignment, it seems. He was last seen as a helicopter pilot in Afghanistan. Now his job is to figure out who blew up the train. He will get repeated opportunities to go back over the last eight minutes before it exploded, and when he goes back, he will remember what he learned the previous times. This is a very interesting premise. Coulter is a detective in a crucial situation. It seems that if he can unearth the terrorist, the miscreant can be prevented from perpetrating far more dire atrocities, which include blowing up much of the city of Chicago. But the narrative is nonetheless doomed -- for several reasons. First of all, sheer monotony. Repeating those eight minutes on the train -- the writer, Ben Ripley, has said his chief aim was "to tell a non-linear story like Rashomon" using "a science fiction device" -- works well enough for two or three times. But take a look at Rashomon some time. Its retellings are all from the viewpoints of different people. We see the eight minutes over and over only through the eyes of Jake Gyllenhaal. He sees more, and does slightly different things, but this is not Rashomon at all. We're stuck in that train car, basically, and everything blows up every time. (Repeated explosions are not enlightening.) It's been said that Source Code is a story that's eight minutes long, and after a while it gets to seem that way. The other reason this thought-provoker isn't as satisfactory as some people seem to think is that its "scientific" basis is so carelessly sketched in, we barely know what it's supposed to be. Apparently there is some evidence the last few minutes of impressions before death remain drawn on the cerebral cortex. But what Jeffrey Wright is doing with Jake Gyllenhaal, and how he could be exploring witnesses' brain impressions by his frantic dashes around the train car, are a mystery. Of course Jake, with his muscular soulfulness, periodically Vera Farmiga, with her teasing remoteness, and briefly the strange Jeffrey Wright, do a great deal to bring human life to this story, not to mention the fact that Duncan Jones' action-film skill set is up and running. It's just that seeing the same eight minutes over and over again through the eyes of someone who may or may not be alive may not be your idea of fun at all. It's not mine. I do give Jones credit for developing a story that has interesting overlaps with his first film (despite the involvement of different writers), and I look forward to his future explorations. The article cited is in Wired. Source Code debuted March 11 at the South by Southwest (SXSW, Austin, Texas) film festival and opened wide in the US April 1, 2011.